Cartonization software combines orders in picking and packing operations for increased efficiency and streamlined path flow. 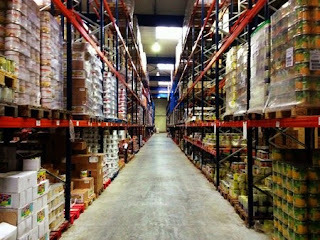 Cartonization software uses advanced mathematical programs to take the guesswork out of carton selection by operators. This automation significantly reduces wasted touches, material and labor costs. Cartonization software reduces material costs by selecting the right size of carton for the product which reduces corrugated and void material expenses. For distribution centers processing a few hundred cartons per day this adds up to hundreds of thousands of dollars per year. By combining voice picking technology with cartonization software, companies significantly increase productivity while reducing expenses. Voice picking systems direct operators through the most optimized path with easy to understand voice commands. Voice picking system with hands free, barcode scanning and pick to light provides improvements in productivity from 35% to 50%. Studies show that when operators have a choice, they will err on the conservative side and choose a larger size of carton. The right cartonization software will select the right size of carton based on SKU weight and dimension data. This provides significant cost reductions for shipping materials. Numina Group is a leading warehouse automation solutions provider, offering voice directed picking and cartonization software solutions. Our warehouse control and execution system, Real–Time Distribution, RDS™, includes the latest in voice picking technology. RDS Voice™ is proven to increase accuracy rates to 99.99%, while reducing labor and shipping material expenses. Combine with print and apply labeling and in-line scanning for maximum productivity and profitability. Automatically printing and applying packing slips and shipping labels at a rate of 25 cartons per minute drastically reduces manual labor while improving accuracy. In-line scanning for weight and dimension verification reduces shipping errors and provides automated final inspection. Numina’s warehouse control system is flexible and scalable to grow with your business, with automated technologies proven to increase productivity and profitability. Our clients typically experience return on investment in 12 to 18 months with ongoing significant cost savings and improvements to key performance indicators. Contact us to learn how you can improve your distribution and order fulfillment performance with reduced costs and increased profit. When searching for warehouse automation solutions, you want to be sure you choose the best technologies that will provide the greatest rate of return. Companies must streamline their order fulfillment process for maximum throughput to meet increasing online order demands and just-in-time delivery requirements. Meeting current demands while poised for growth is necessary for ongoing sustainability. Be sure to work with an experienced warehouse automation company who provides comprehensive solutions rather than companies focused on selling you equipment. Numina Group is a recognized leader in warehouse automation solutions offering detailed warehouse design, robust warehouse control software and advanced automated technologies. Numina Group provides turnkey automated solutions to meet demanding order fulfillment requirements, starting with a detailed warehouse design study. Our skilled engineers conduct SKU velocity analysis, value stream mapping, capacity studies and evaluate all material touches to eliminate bottlenecks and identify wasted touches and areas for improvement. We show you where and how you will improve throughput and reduce costs with projected return on investment. Our Warehouse Control System, RDS™, is robust warehouse control software driving advanced technologies to provide real-time warehouse control. RDS easily integrates with existing warehouse management systems (WMS) and enterprise resource planning (ERP) systems, driving advanced technologies customized to your process. RDS streamlines all pick, pack and ship processes with a family of flexible modules, scalable to grow with your business. Print and Apply Labeling System – automate the printing and applying of labels to cartons with increased accuracy and reduced cost. 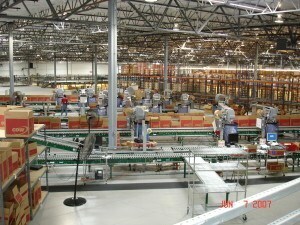 This area is often a bottleneck for order fulfillment operations. Our print and apply solutions can process up to 25 cartons per minute for significant improvements in meeting order delivery deadlines. Voice Picking System – RDS Voice™ is proven to improve accuracy to 99.99% while increasing productivity with hands free, automatic barcode scanning and validation. Easy to understand voice commands direct operators through the most optimized picking path with batch wave management optimization. Inline Scan-Weigh-Dimension –in motion scanning provides vision inspection, ship verification and automated sorting to eliminate shipping errors. Print-Fold-Insert – automatically print, fold and insert shipping documents, packing slips and dual sided packing labels and forms of compliance. Numina group is your leading warehouse automation solutions provider, providing turnkey automated systems which significantly improve productivity and profitability. Numina Group is your one-stop for turnkey warehouse automation solutions. We provide skilled design, robust real-time warehouse control software and advanced automated technologies. Contact us to learn more about our proven automated warehouse solutions. With the continual increase of e-commerce, distribution centers worldwide realize that the need for quick, efficient and accurate order fulfillment has never been greater. Many distribution centers are realizing the benefits provided with voice picking technology. 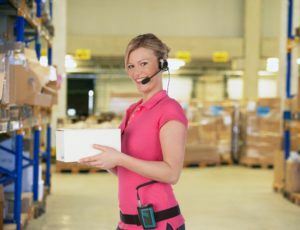 Voice picking systems are utilized in order fulfillment, omni-channel, third party logistics (3PL), manufacturing and many other industries that require warehouse automation and control. When evaluating the benefits that voice picking systems provide, be sure to speak with a reputable warehouse automation company. Experienced automation experts will take the time to understand your needs and design your automated solutions customized to your specifications. Numina Group is a leading warehouse automation company with decades of experience in advanced automated technologies and skilled designers who partner with you from the beginning to design the most streamlined order fulfillment process. Numina’s RDS Voice™ provides these benefits and many more. Real-Time Distribution is a Tier 1 Warehouse Execution and Control System (WES-WCS) compatible with SAP, NetSuite, Oracle, Microsoft dynamics, JDE, IBM I series and virtually any other database. RDS™ easily integrates with existing warehouse management systems and enterprise resource planning systems for real time control of your order fulfillment process. Numina is your one-stop for warehouse automation customized to your distribution operations. We partner with you from the beginning and provide ongoing support to ensure your success. Numina Group offers skilled warehouse design, robust warehouse control software and advanced automated technologies. We provide customized automated solutions to maximize productivity and profitability. Contact us to speak with an engineer and learn how voice picking and warehouse control will improve your order fulfillment process.